UNITED NATIONS, July 23 -- As Ambassadors drifted toward the UN's debate on Responsibility to Protect on Thursday morning, the handful of reporters assembled were asking, what is this about and why should I or my readers care? Usually skeptical correspondents were thrown for a loop by a story in the paper of record -- if they say it's important, it must be, seemed to be the trend among reluctant scribes or their editors. But what is it all about? Only half facetiously, it's all about Ed Luck's job, is Inner City Press' theory. At least that's the litmus test. Proponents of R to P argue that the concept was unanimously agreed to in 2005. But why then did the same 192 countries, serving on the UN budget (Fifth) committee, reject Secretary General Ban Ki-moon's naming of Ed Luck as Assistant Secretary General for R to P, and deny any funding to his office? Gareth Evans, who on July 22 claimed that R to P was implemented by the UN this year in Sri Lanka, called any decision on Ed Luck's office a mere "arcane" detail. Other proponents of R to P have tried to say that the issue of funding Luck's office isn't expected to come up during today's debate. But that would be a loss for the concept. A Fifth Committee expert tells Inner City Press that the committee is unlikely to fund or permit the R to P office even in its next session unless the General Assembly affirmatively passes a resolution accepting the recommendations in Ban Ki-moon's report. Therefore, no outcome is a loss for R to P.
Even some who'd heretofore been supporters of R to P now question it. What good is a concept, which is claimed to be universally accepted, if nothing is done when thousands of civilians living outdoors are shelled from the air as happened in Sri Lanka this year? As with so many things at the UN, grandiose words are unacted upon, leading to endless cycles of cynicism. 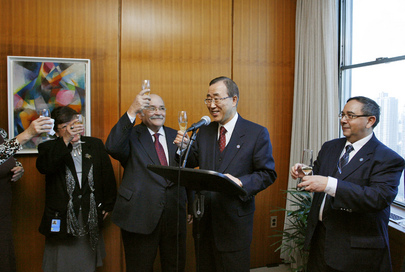 Wasn't it Ban Ki-moon who said, when he started as Secretary General, that the UN should promise less and deliver more? R to P is nothing but promise. Sending Kofi Annan to Kenya could have been done with or without R to P. They said he went for the UN, but Annan has neither reported to the Security Council nor has Ban's Office confirmed that Annan asked before filing names with the International Criminal Court. The proponents of the concept had wanted this debate to be held in April, to tie it to the genocide in Rwanda in April 1994. 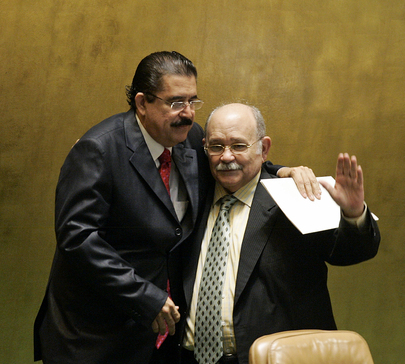 But President of the General Assembly Miguel d'Escoto Brockmann, a detractor, delayed the debate until July, and put intervention skeptic Noam Chomsky on the panel. On Thursday morning, the press was told there'd be a stakeout by "participants" in the debate at 10 a.m.. But there was no UN TV camera, and no one stopped to talk. Later it was announced that Team d'Escoto had rescheduled the stakeout for 2:45 p.m. Outgoing UK minister Mark Malloch Brown, it was said, would not arrive at the UN until the afternoon. Delegates milled around the hallway. Most spoke about Noam Chomsky. "I've never seen him," said a once and perhaps future UN official. Watch this space. Update of 11:36 a.m. -- After the Cote d'Ivoire stakeout, Noam Chomsky is still speaking, denouncing the Security Council as biased. At the stakeout, the representative of the Laurent Gbagbo govenment of Cote d'Ivoire just told Inner City Press, which asked "vous avez besoin de troupes?" (does Cote d'Ivoire need troops, that is, UN peacekeepers) -- "No, we do not need troops." Yesterday, proponents of R to P used Cote d'Ivoire and Juan Mendez' mission there as a good use of the concept. Update of 11:39 a.m. -- Noam Chomsky has finished, and Germany speaks first, a "remark to Professor Chomsky." He critiques Chomsky for speaking about "the cousin and the skeleton" not on R to P.
Update of 11:42 a.m. -- the Ambassador of Egypt, sitting next to Ecuador, asks about the balance between the Security Council and the General Assembly. He says R to P is a critique of the Security Council on Cambodia, Rwanda, Lebanon and Gaza. He mentions Myanmar. Update of 11:45 a.m. -- the Ambassador of Sweden says Chomsky is speaking about the past, we should focus on the present and future. He wants to hear from Gareth Evans about early warning. He mentions Cambodia, Srebenica, Rwanda "or the Holocaust for that matter." Update of 11:46 a.m. -- the representative of Japan, not Ambassador Takasu, says let's not reopen the debate. He says he did not ask for the floor. Update of 11:47 a.m. -- the Ambassador of Chile, Geraldo Munoz -- who Inner City Press has reported is looking for a UN job -- asks Chomsky to put his ear piece on, since he is directing a comment to him in Spanish. He mentions Honduras, implies that (all?) of Latin America is for R to P. "Singing for his supper," says a skeptic. Update of 11:52 a.m. -- Ghana is speaking, citing prinicples of "non interference" but also "non indifference." He mentions apartheid. Update of 11:55 a.m. -- Now it's Djibouti, to be followed by the "first two panelists" responding. Then it will be Sudan, Tanzania, Timor Leste, Morocco, Bosnia and others. Djibouti speaks of selectivity by the Security Council. Update of 11:58 a.m. -- Gareth Evans speaks first, jumping gratefully on Sweden's set up question about early warnings. Will he speak about Sri Lanka? He speaks in a round about way about an office including the advisor on R to P: that is, Ed Luck, which only yesterday Evans said was too arcane for him to get involved in. He refers to the budget process and urges member states to take it up. Yesterday he said he woudln't speak to that. Hate to say it, but.... told you so. Update of 12:02 p.m. -- Evans says R to P never meant to give more power to the General Assembly, that action must be taken through the Security Council. Then he tells Djibouti that regional organizations can work around the Security Council, saying this happened in, where else, Kenya. Now he's on to Juan Mendez in Cote d'Ivoire. But where is Mendez' report? Update of 12:07 p.m. -- Chomsky begins with the bombing of Serbia, "it think it was a real crime." He says R to P repeats the old consensus. He says the 2005 statement is okay, but has striking omissions. UN TV switches away from Chomsky's comments: the noon briefing has begun. 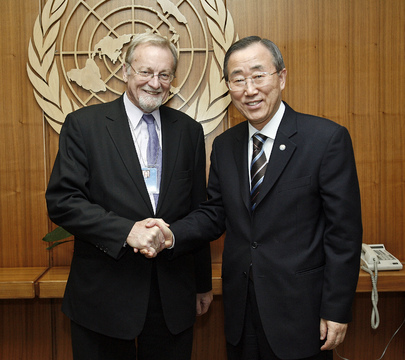 UNITED NATIONS, July 22 -- The day before the UN's July 23 debate on the Responsibility to Protect, R to P proponent Gareth Evans claimed to the Press that the Security Council's actions on Sri Lanka earlier this year were a "significant factor in moderating what could have been a greater catastrophe." Inner City Press asked Evan, what Security Council actions? As reported here, Sri Lanka was never put on the Council's agenda. Instead it was the topic of a handful of closed door meetings in the UN's basement. Progressively weaker -- and never formal -- statements were made afterwards, the last time without even a UN TV camera there. Is this was the UN's version of Responsibility to Protect looks like? Video here, from Minute 33:12. Evans maintained that the UN's responses to the conflict in Sri Lanka, including "strong Presidential Statements," show that R to P is a "concept gaining traction" and in this case saving lives. He said this was the position of the International Crisis Group, leadership of which he handed over to Louise Arbour on July 22. We'll see. Ironically, the UN Secretariat seems to want to keep R to P, or at least senior officials connected to it, invisible. Earlier in the week, there was a briefing on the topic by two individuals who, it was insisted, could only be identified as "senior UN officials." Inner City Press asked one of them how R to P should have applied to Sri Lanka, and if they agreed with those who said the concept was not implemented during this year's conflict. The official replied that it is "too early to tell" if R to P succeeded in Sri Lanka. But that phase of conflict was ended in a bloody final assault, and 300,000 people are now locked up in internment camps not "30,000," as ResponsibilityToProtect.org has it.) It's still too early? Afterwards, Inner City Press asked the official if his response about Sri Lanka could be on the record. I'd rather not, he said. Evans, like other proponents, cited Kenya as an example, and also the mission of Juan Mendez -- advertised for the July 22 press conference but not present -- to Cote d'Ivoire when the country was still split in two. Mendez' report about incitement in Cote d'Ivoire has never been released, and Kofi Annan has not return to brief the Security Council about Kenya. Inner City Press asked Evans and his fellow panelist Thelma Ekiyor of the West African Civil Society Institute if they thought R to P applies in the case of Somalia. Evan, who previously told Inner City Press that Somalia was not a case of R to P during a media session to promote his book on the topic, now said there is "no harm in viewing" it that way, as one of ten to fifteen situations to which R to P is relevant. But if the UN's response to Sri Lanka is any predictor, what good would it do? Ms. Ekiyor said everything is with hindsight, "could we have gone into Sri Lanka? ... Can we forecast, to prevent genocide? Then we make some inroads." Video here, from Minute 36:40. But the UN's mechanism for early warning, the contested office of Ed Luck, has not been funded. Inner City Press asked Evans if he thought that would be addressed during this week's debate. Evans called it an "arcane" debate, best left to the UN's budget (Fifth) committee. Video here, from Minute 41:11. But a Fifth Committee expert reminded Inner City Press that there are various action items at the end of the Secretary General's report, which will supposedly be debated on July 23. 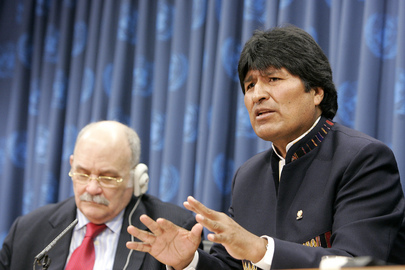 If, as is said, no outcome is expected, how could the UN move to monitoring or early warning? Or will the proponents of R to P be proud, or say they are, of a few basement meetings of the Security Council while civilians are being killed? Watch this site. UNITED NATIONS, July 21, updated -- While this week's UN debates on the Responsibility to Protect looks to many like just another pro forma gab fest, R to P proponents view it as an attempt by the Sandinista President of the General Assembly Miguel d'Escoto Brockman to undermine the concept, perhaps through a last minute "outcome document." On July 20, at an event across the street from the UN attended by Secretary General Ban Ki-moon's main advisor on R to P Ed Luck, William Pace of the World Federalist Movement* denounced d'Escoto for having refused to hold the session in April, to coincide with the 15th anniversary of Rwanda's genocide. Pace said d'Escoto now gave only 10 days notice, then circulated an "inappropriate document" and proposed a debate between Noam Chomsky and, for R to P, Gareth Evans, also slated to appear at a press conference on July 22. The "inappropriate" concept paper, or "non-paper" as it's called in the UN, was described by several pro R to P Ambassadors as laughable, worse than D'Escoto Brockmann's unilateral draft on the global financial crisis. A staffer from d'Escoto Brockmann's office sat taking notes. Interviewed later by Inner City Press, he said Pace's vehemence surprised him: all d'Escoto is asking for is a debate. He said the concept wasn't really debated in 2005; he mentioned the humanitarian pretext for the invasion of Iraq. Pace said that d'Escoto had inappropriately "politicized" the position of PGA and was trying to undermine the support of 150 heads of state for R to P. Pace even accused d'Escoto of timing the debate for July 23 specifically to occur when Ban will be out of town, in China. Because of Ban's trip to China -- some wondered if he would raise the situation of Uighurs in Xinjiang in Western China, as a matter of R to P or otherwise -- he unveiled his report to the General Assembly on the morning of July 21. The report was only half unveiled: journalists complained that the UN's Media Resource Center had no copies of the report. Whatever happened to the Responsibility to Print? And why did Team Ban, when it held a press conference on June 20 about R to P, demand that its two speakers not be identified by name? Afterwards, Inner City Press asked one of them, who had said regarding Sri Lanka that it is somehow "too early" to tell if R to P was implemented, if the quote could be used with attribution, since the persons is a senior Ban administration official. "I'd rather you didn't," the senior official said? Who took the responsibility out of the Responsibility to Protect? Watch this site. Update of 10:17 a.m. -- Former Ambassador of India Nirupam Sen, also denounced by Pace for his positions in 2005 about R to P, arrived in front of the General Assembly. A staffer for D'Escoto's Office, for which Sen now works, spirited him further along the second floor. The door to the PGA's Office was closed. D'Escoto, his spokesman said, will be returning to New York today. Update of 10:56 a.m. -- the GA session ended, much faster than most had expected. "Only five countries?" one attendee snarked to Inner City Press, calling Ban's delivery "flat" and predicting the real fireworks will be Thursday. The deputy permanent represenative of North Korea -- the DPR of the DPRK, as he's called -- ambled out, looking bemused. Ban rushed out, with his advisors Vijay Nambiar and Kim Won-soo. Sen stayed to schmooze the crowd. Inner City Press asked a Georgian diplomat what he thought of the Responsibility to Protect. We need some, he said. * -- it was later pointed out at the full name is the World Federalist Movement-Institute for Global Policy, which is part of the International Coalition for the Responsibility to Protect, duly noted.